Sky's Rizwan Siddiqui writes: This year's final was contested between first-time entrants Monopoly and league stalwarts Sky, who had been battled-hardened by defeating Caledonian Conquerors, Vallance and Dover Castle en-route to the final. after 3 overs with 16 on the board. Fortunately for Sky, cometh the hour, cometh the man (of the match!) 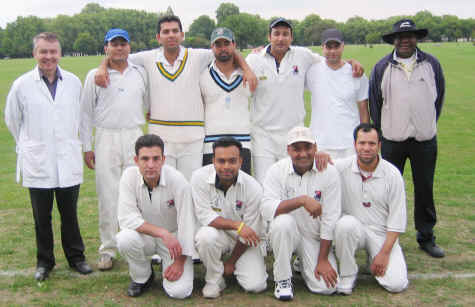 and Nozmul commenced a merciless counter-attacking onslaught on the Monopoly bowlers and was well supported in the middle order by Imran Yousaf and Rizwan. Although the last two overs yielded only 11 runs the damage had been done and Sky ended up with a total of 155 off their full complement of overs. The Monopoly batsman started cautiously, however, with wickets falling at regular intervals (from the first over onwards), the momentum they needed to chase down 155 never materialised. Tight bowling from the two Imrans and Rizwan allied with the dangerous leg spin of Kazmi led to the demise of their innings for 78. Both teams would like to express their gratitude to Colin and Steve for officiating in the final.